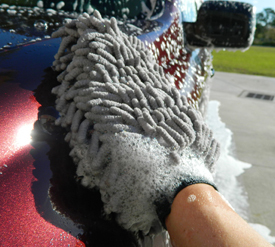 The Supreme Micro-Chenille Wash Mitt holds a huge volume of water and soap solution in its long microfiber fingers. These microfiber fingers lather your delicate paint surface in high lubricity suds while removing dirt and grime, reducing swirl marks and washing damage. The microfiber fingers of the Supreme Micro-Chenille Wash Mitt are 40% larger than standard micro-chenille wash mitts. Best of all, this mitt is equipped with a double-stitched cuff and a soft double-insulated liner. The result is a comfortable and durable wash mitt that is suitable for washing the most delicate paints. Pamper your vehicle's delicate finish with super-soft microfiber!